Authored by three prominent specialists in the field, this text provides comprehensive coverage of diagnostic and treatment modalities for optimal glaucoma management. Revised throughout, this new edition presents the latest guidance in clinical examination, randomized trials, medical treatment, laser therapy, and surgical procedures. Hundreds of illustrations—with many classic black and white figures from the previous editions supplemented with new color images—depict the features of glaucomas and step-by-step procedures for their management, while expanded use of highlighted boxes, lists, and summary tables make the material easy to access. Evidence-based and updated information on all aspects of the glaucomas—including physiology, genetics, interventional trials, and new surgical techniques—offer a well-rounded foundation of knowledge for making the most informed diagnoses and choosing the most effective course of treatment. 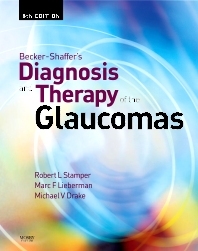 Combines the cumulative experience of three prominent glaucoma specialists—addressing a full range of clinical needs for practitioners of all levels—for a uniquely written coherent perspective. Includes extensive references to current and historically important sources to provide comprehensive interpretation of the latest medical literature.